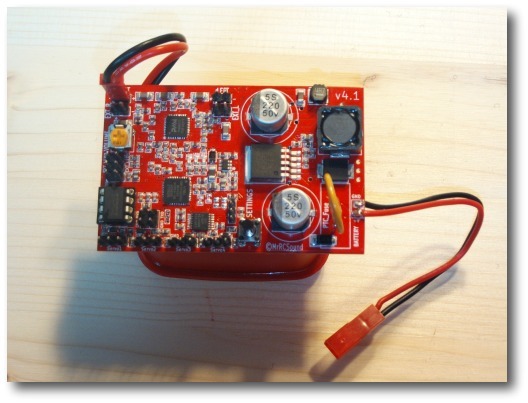 This RC aircraft sound unit is the latest from MR RC Sound. Speaker less! Light weight. Full specs and details here. Safe and secure payments through PayPal. Please look at the latest unit with all the improvements- The MR RC Sound Aspire Unit by clicking here! 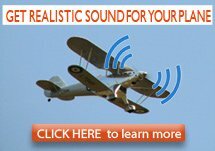 A revolution in how sound is produced for your RC aircraft. The brand new TT-25 transducer replaces the Max2-SPL speaker. The whole airplane becomes the speaker and no cheater sound hole is required for the sound to escape. 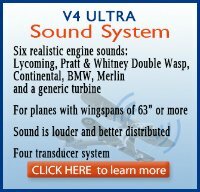 This RC aircraft sound system is best suited for airplanes with a wingspan of 1200 to 1600mm (43" to 63"). 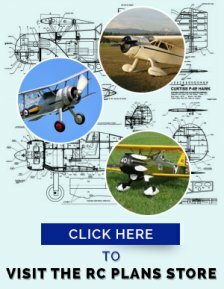 In some cases it may be possible to squeeze it in to smaller models, depending on space available in the fuselage. It needs room for the PC board (2 7/8" x 1 7/8" x 1" high) and space for the 2" diameter x 1' high transducer. total weight is now 4 oz. The unit now features one PC board, as shown in photo above. It is now all one card. The sound card, amplifier, and voltage regulator are on one dual sided card, approx. 2.7" x 1.9". This means it is smaller, lighter, and has less connections that may cause problems. The processor and memory are different, and larger. This allows for more complex, higher quality sounds. 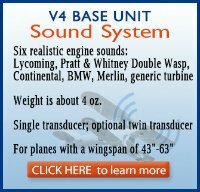 The unit comes with a default set of 6 engine sounds - Continental, Lycoming, Merlin, P&W Double Wasp, Daimler Benz 801 and a Generic Turbine. .The unit will support up to 8, higher quality, engine sounds. Plus an Aux. 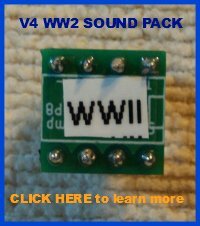 sound pack for the 3 inputs. Sounds will be selected by a push button. Sounds are on a removable chip, holding up to 6 engine sounds, plus additional sounds. This allows different sound sets of 8 sounds to be used on one unit. 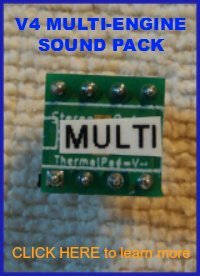 In the future, we plan on carrying a number of stock sound sets/chips and should be able to do custom sound sets on request. Many detail improvements, that enhance performance and reliability, including built in chokes and a large fuse, along with voltage protection. An Automatic Airplane Finder is now built in! If no throttle input is made for a period of about 3-4 minutes, the system assumes the airplane has gone down, and emits loud finder 'beeps". 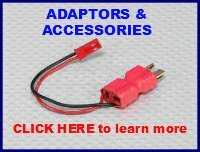 Auxiliary outputs for a second amplifier. Now you can plug in a second amplifier of your own choice or use our Amplifier/Regulator Upgrade Unit, to convert the Base Unit to a 4-speaker "Ultra" unit that can produce up to 112db at 1m! One Lycoming Gun 1 "Clear" "Clear prop"
Three Continental Gun1 "Clear" "Contact"
The V4.1 card. Size- 2 7/8"x1 7/8"x1" high. Weight=1.5 oz. The TT-25 transducer-2"diameter and 1" high. Weight= 2.5 oz. Y-connector for power supply- (Click here for popular standard connectors) or make up your own, for your particular battery connector. Please note that this unit is no longer available! Click here for all the details of the new Aspire unit that replaces it. 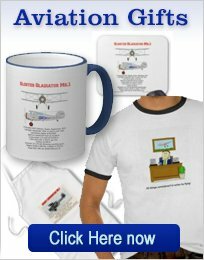 Frank, a return customer: "YES, I really like how you have brought more realism to the RC planes. I really like the "electric" RC planes and heli's but never really liked the way they sounded in the air. You have changed that in a big way. 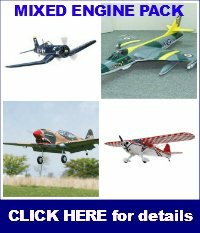 There are a few more planes I want to update with your RC aircraft sound modules"
Robert Bridger (Sussex UK): "What a brill product! All amazing extras. Just what I have been looking for. 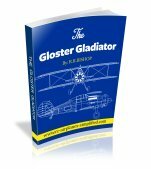 It just brings all my aircraft to life and for not a lot of money. Thank you all at Mr RC Sound! 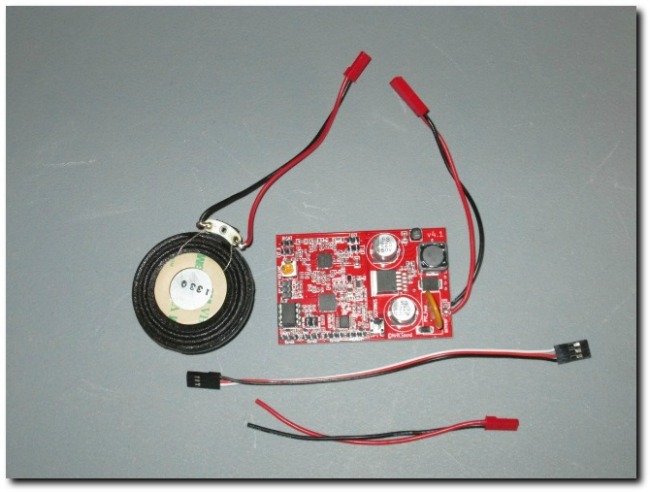 SIZE: PC BOARD- 2 7/8"x1 7/8"x1"
TT-25 TRANSDUCER.-2"diameter X 1" high. 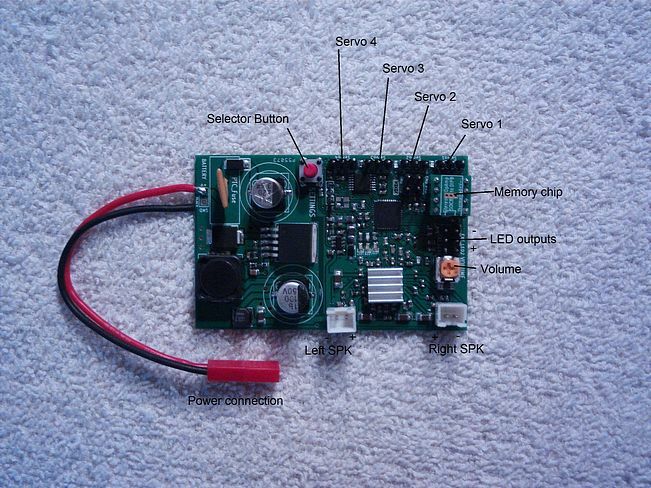 SOUND OUTPUT: Up to 108db with 1 transducer at 1M..
POWER DRAW: Approx. 1A/12W on 1 transducer, 1.5A/22W with 2 transducers. MODEL SIZE: 43"-63" (1200-1600mm) Wing span.